What a depressing proposition for a small business owner. I received this card in the mail from Google AdWords today. Basically the card says that there are a ton of people searching for what I sell and the only way to reach them is to pay Google for an ad. How depressing. Along with the card came a $150 AdWords credit, which a user only receives AFTER they’ve spent $150. I guess it could be a good deal, but it does come with that up-front cost. Google is counting on small business to sign up and blow their budget based on Google’s own recommendations. AdWords recommendations often include many “broad match” keywords which will blow a budget really fast on irrelevant clicks. For example, if your company manufactures metal springs and Google recommends the broad match term “spring manufacturer”, your ad will display for queries like “when does spring begin” and “Royals spring training schedule”. Once the account has exhausted the initial $150, a Google representative will probably call the business and “help” setup the account to perform better. It makes them seem like they are a real helper and that they have your account well in hand. It’ll make you think they’re doing you a favor by “optimizing” your account for FREE, unlike companies like mine that charge a fee to set things right. What they’ll really do is setup your account to spend the most money possible and make you think that they are helping you gain the most “exposure” possible for the least cost possible. Google released Q2 2015 earnings numbers which show $17.7bn in revenue with $12bn earned from advertising on Google’s websites (AKA AdWords). AdWords accounts for 70% of Google’s earnings. They’re not going to help any businesses save money. Period. Despite what you just read, I do not hate AdWords. In fact, it can be a great source of targeted traffic if the campaign is administered by an expert. Unfortunately, most companies try to go it alone. I talk to a lot of t business owners and marketing directors who say they’ve tried Adwords, failed and refuse to try again because it was such a waste of money. If I can talk that person into trying again, they see much different results with us at the helm. I’ve been running PPC campaigns since before Adwords existed and I’ve been running Adwords accounts since a couple of weeks after it launched back in 2000. In fact, when Google launched AdWords I already had about two years worth of experience with administering PPC campaigns. 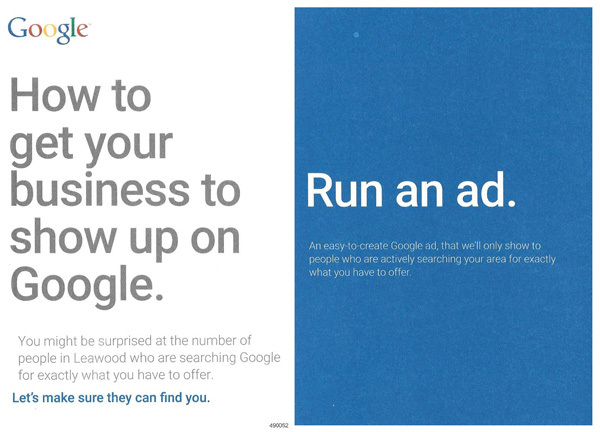 If you get one of these post cards and aren’t sure if AdWords is right for you, let us know. We can get you setup for success. There is other good news too – we can help you get your business to show up in Google in the organic results! In the organic results you can get all the clicks you want with no cost per click fee! With AdWords once your budget is exhausted your ad is taken down but when we get your site ranked using our expert SEO services, your site will stay there for years to come and get as many clicks as the results will generate.